At the top level, football has long ceased to be simply about 22 men on a pitch kicking some leather around. If there was anyone around still not aware of this, Real Madrid has provided another reminder of that recently. Manchester United may have cafes and stores all around Asia, but the Spanish powerhouse has announced that it will be building a holiday resort in the United Arab Emirates. Actually, it’s less a resort than an artificial island with all kinds of amenities – just take a look at the picture, with a marina fashioned in the shape of the club’s logo. As well as ample space to park your luxury yacht, there are luxury hotels, stadiums, an amusement park and all kinds of sports facilities in the 430,000 square meter island. It will cost around $1 billion, and is expected to attract a million visitors in 2015, when it’s due to open. Real Madrid President Florentino Perez talked as if he was president of a country rather than a football club. “It’s a decisive and strategic step that will strengthen our institution in the Middle East and Asia,” Perez said as he explained the club’s partnership with RAK Marjan Island Football Investment Fund. The Ras Al Khaimah government, one of the Emirates, is also involved. The newspaper suggested that a big reason behind the plan is the new Financial Fair Play (FFP) regulations that are being introduced by European confederation UEFA. This is to force clubs to try and spend within their means instead of going into massive debt or relying on shady foreign owners. Clubs that spend more than they generate will be penalized but, as the report states, money spent on infrastructure isn’t counted. Consequently, if this outlay can be categorized as such, then it means that Madrid can increase its income and thus be able to spend more on players in the future without falling foul of FFP. It could be a success. 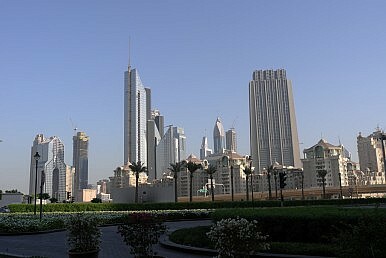 UAE is, as Perez noted, within four hours flight of two billion people. It’s also much closer and easier for the football fans of East Asia than actually going to the real thing in Spain. Real Madrid have thrown down quite a gauntlet to their European rivals.